How Can I Not Show This? 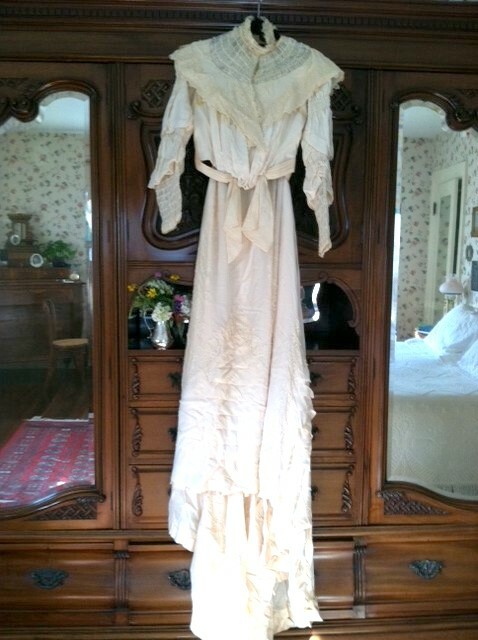 I am named for a certain person and this is her wedding gown, which she wore for four short hours in 1903 when she married the lad she had met in college and a fine-looking lad he was as you can see up close by clicking on his photo below. 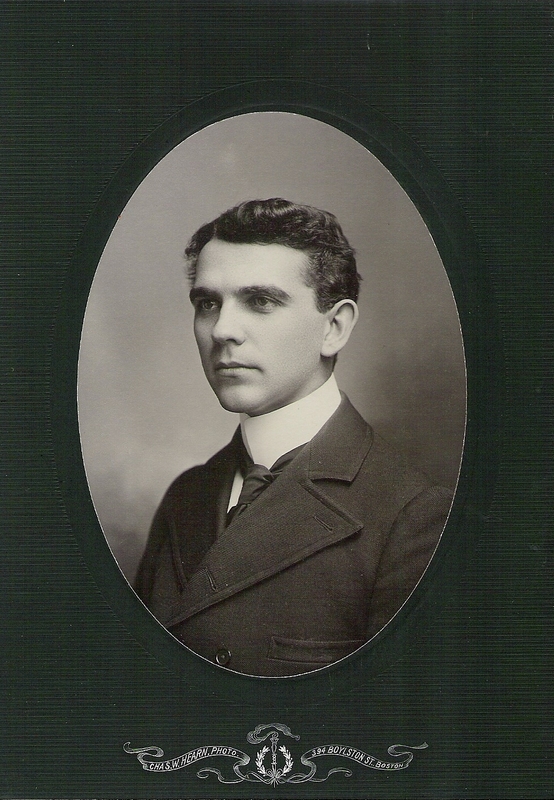 Who knew he would one day become a judge and the Chairman of the Boston School Committee and take on that scalawag mayor of Boston, James Michael Curley? He was but a lad then, the first in his family to get past 8th grade and she the third child of the weaving supervisor at the mill. They were born in the 1870s to people with fresh memories of the Crossing. Anyway, yesterday I took out this dress again and noted again how she had sweated into its bodice, this girl who died so young that her children for all their trying could not bring back her face much less the sound of her voice, being only one, two, four and six at the time. 75 years later, when the then-six-year-old lay dying as an old man in a hospital bed, I brought in to him his mother’s silver mirror-and-brush set and he said he could then ‘see’ her again; see her for the first time in his mind as she sat at her dressing table brushing her long, long hair. I can’t see her because I never knew her; but the first time I saw the bodice of her wedding dress I pulled my T-shirt right off and tried it on. Then I knew about her tiny waist and small breasts. And when I pulled the long silk skirt from the yellowing tissue paper, I kicked off my jeans then and there and tried it on too. That’s how I found out how tall she was. She was my height exactly and she haunts me, ah how she haunts me. Her death set off a sadness in my family that has ramified down through the decades. I feel so lucky that her young husband did not die but lived to be an old man and grandfather to many, modeling a kind of willed optimism that made of me the merry child I was, when things could so easily have gone in another direction. A fatherless child, I lived in his house and under his care. He called me ‘Blackberry Top’ for the tight dark curls emerging on my baby head. We owe for so much in this life; how can we ever repay it, except through reverence and thanks? Some things fade: these flowers are starting to fade, and the dress comes apart in my hands. This silver creamer, meanwhile, seems to endure, as does this image of that Maloney daughter called Caroline Theresa who lived on the little rise of land just across from the mill. What better way to “repay it” than name your own children in remembrance of them as each generation in your family has. tough for future generations to keep us straight though Mike! Your memories remind me, Terry, of my grandfather who was brought here from a far-off land because of his knowledge of making glass. Arthur. Arthur Michaux. I wish that you could have known him and would write some wonderful words of him. I wish that too Art! When did he come? And was it from France? Belgium maybe? Tell us! What an evocative piece, Terry…with lovely photos. 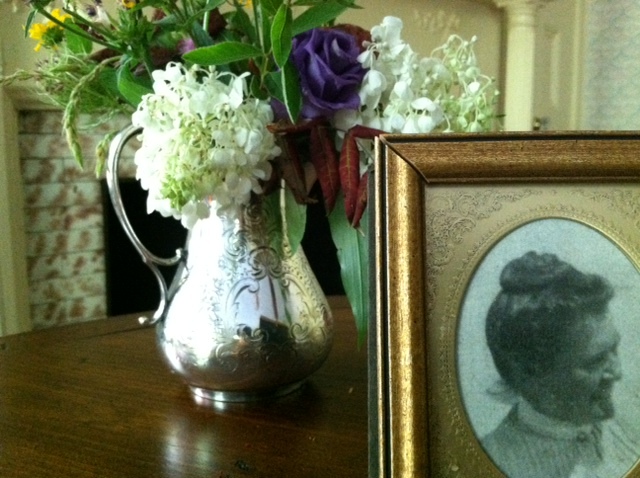 Morgan thanks… My house is like a a museum I fear One day you will have to come see. Very odd. Like a weird old Faulkner short story ! I do so enjoy your postings. I am a romantic nostalgia lover myself. Nostalgia really almost threatens to overtake me at times. I am glad to know I am not alone Rip! Arthur Michaux said farewell to his parents at age 12 in Belgium and sailed to America, the land of opportunity armed only with his worldly possessions and his knowledge of the glassmaking process. His destiny was to settle here with some rather distant relatives and go to work as a consultant for a company that was to become PPG. On board ship, he made friends with strangers, fellow countrymen coming to America for various reasons. One particular, family took him under their wing. Their daughter, Florence, was the same age as Arthur. I guess it could be called a “lifelong friendship” with that family. Six years later Arthur and Florence were married…and as far as I recall as their only grandchild, lived happily ever after. A romance that began in Heaven, if not on the high seas of the Atlantic Ocean. Lucky me! Really enjoyed reading this very moving article about your grandmother Terry. I can almost hear those babies crying for their mama. So sad, but sounds like they all survived with the help of their loving father. Now Mary Sullivan. which Mary Sullivan might you be? Thanks so much for this and tell me more! I am Mary Sullivan from Granville, MA. Always enjoy your observations and stories of life!! I thought you commented to me before that years ago you had relatives living in Granville. Now I remember; it’s just that I seem to know so MANY Mary Sullivans. yes that handsome young man in the picture grew up on a farm in your town… You are very kind Mary, thanks for this!